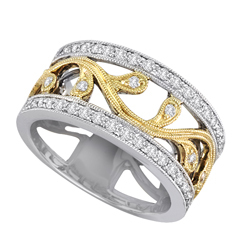 Yellow and White Gold Diamond Band. This band has a yellow gold scrolling design with diamonds on the scrolls. There are white gold shoulders with diamonds going half way down the band.